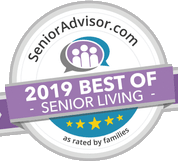 Arbour Square of Harleysville is proud to announce that they have been selected as one of 2019’s Best of Senior Living Award Winner on SeniorAdvisor.com, the largest ratings and reviews site for senior care and services in North America and Canada. SeniorAdvisor.com is in their sixth year of hosting the Best of Senior Living Awards. SeniorAdvisor.com’s Best of 2019 Award winners represent the best of the best in-home care, assisted living, and other senior living providers, based on the online reviews written by seniors and their families. This exclusive designation honors the top one percent of senior care providers across the United States and Canada. The annual SeniorAdvisor.com Best of Senior Living Awards tabulates over 200,000 family created reviews to find the highest quality care providers for this honor. Of the nearly 45,000 communities currently listed on SeniorAdvisor.com, just over 950 were recognized with this prestigious award. As SeniorAdvisor.com’s ‘Best of Senior Living’ awards enters its sixth year of honoring the top family rated communities and care providers, we are proud to say that the bar has been raised. In order to ensure only the best communities and care providers win, we decided to make the criteria harder than ever and we saw over 1600 winners rise to the occasion. Each year we are more and more impressed with the quality of winners and look forward to spreading the word about these award-winning organizations. 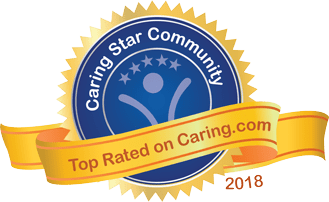 To qualify for inclusion in the Best of 2019 Awards, care providers must have maintained an average overall rating of at least 4.5 stars, while receiving four of more reviews in 2018. Additional details and a complete list of award winners can be found on SeniorAdivsor.com. SeniorAdvisor.com is the largest consumer rating and reviews site for senior living communities and home care providers across the United States and Canada with over 200,000 trusted, published reviews. The innovative website provides easy access to the information families need when making senior care decision, and features reviews and advice from community residents and their loved ones. For more information, please visit www.SeniorAdvisor.com. Arbour Square of Harleysville is an all-inclusive, independent living community that promotes a vibrant retirement lifestyle. Services include delicious home cooked meals served in our beautiful dining room, activities and social events, exercise and wellness programs, trips and transportation, housekeeping services and much more. Arbour Square offers residents a month-to-month lease with no long-term contracts or entrance fees. For more information, please call Julie Kline, director of marketing, at 267-677-1200, or visit www.arboursquare.com. 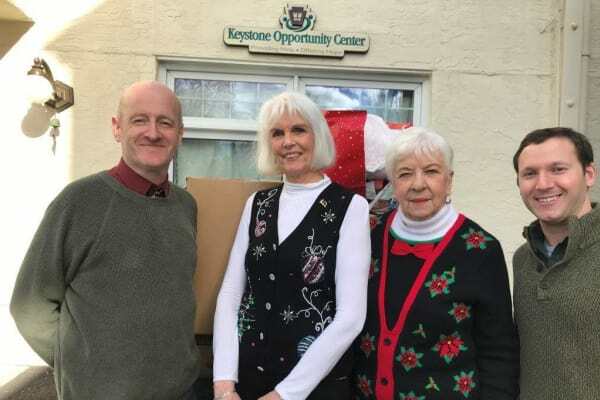 In November, residents at Arbour Square of Harleysville partnered with the Keystone Opportunity Center on a project called “The Giving Tree,” which helps to provide gifts to people in need during the holiday season. Arbour Square has worked with Keystone Opportunity in the past but has always made monetary or food donations. Every year, the Keystone Opportunity Center collects high-value gift cards that are distributed to clients in need during the holiday season. This is the first year that the Giving Tree was ever done. With the Giving Tree project, the Resident Association of Arbour Square prepared tags that could be used as ornaments on a tree with the gender and ages of people who needed gifts for the holidays. Residents could come and take the tags off the tree and buy gifts for the person the tag pertained to. “The residents could not have been more obliging,” said Hendershot. Hendershot worked with Arbour Square Resident Life Director Barbara Lewandowski to have the tree up a few days before Thanksgiving. Lewandowski then notified residents to take a tag, if they chose to do so, and have their gifts dropped off by the end of November. By Dec. 4, over 200 gifts had been collected and were transported via Arbour Square’s bus to the Keystone Opportunity Center in Souderton. “Overall, over 400 gift cards were donated to Keystone Opportunity Center, in addition to the bus-load of donations from Arbour Square,” said Friend. Following the success of this year’s donations, both Arbour Square and Keystone Opportunity Center look forward to continuing this tradition in the years to come. “Absolutely we will be doing this again,” said Serianni. “We value the continued friendship and support of Arbour Square residents year-round,” added Friend. Woodshop. It’s not just a man’s hobby. At Arbour Square of Harleysville, three women are proving they can wield a hammer, too. Tasniya Minthorn, Bille Shaffer, and Nancy Naile meet once a week in the Woodshop Studio to work on small projects. So far the women have finished napkin holders, decorative cutting boards, and more. The woodshop was created at the request of male residents and visitors who were looking for a space to work on their individual projects. With six different workstations, residents can come to class to tinker with an existing project or bring their own idea. There is a small cost to cover the project pieces, but all other materials are provided. No experience is required, and the class is instructed and supervised by Richard Klapper. Minthorn, 84, is described as being crafty by nature. She was looking for a new creative medium to explore when she discovered the class over a year ago. Shaffer, 103, is currently working on a special gift. She enjoys working with her hands but most of all she takes pride in giving her masterpieces to those who matter most. After discovering Woodshop Instruction on the monthly calendar, Naile, 87, was intrigued. She also had no experience and wanted to learn more about the class. Never did she think she would undertake a project the same day. These women take pride in learning a new skill, which has now evolved into an everlasting hobby. 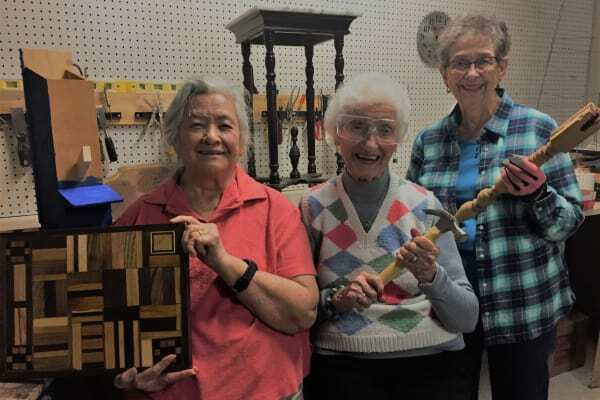 If you’re interested in learning more about woodworking or other activities offered at Arbour Square, call Julie Kline at 267-677-1200, to schedule a tour today and see for yourself why seniors love life here. The keys to good health aren’t much of a secret—exercise and eat right. It seems simple, but many older adults aren’t maintaining their physical activity level and are choosing quick, easy microwave meals instead of cooking with fresh ingredients. Arbour Square of Harleysville, an independent senior living community in Harleysville, Pennsylvania, recognizes the importance of a healthy lifestyle among the senior population and is working toward changing the focus of health and wellness for over 270 residents. Nestled within 22-acres, the senior community features a beautiful walking trail, where you're bound to bump into residents partaking in a fitness class or out for a leisurely stroll. This was the initiative used when revitalizing the fitness center—making health and wellness a lifelong goal. The state-of-the-art facility features a 65-inch screen television, free-weights, stretch bands, and various exercise machines like an elliptical and stationary bike. Sherer’s services include physical therapy, occupational therapy, and a wellness program. He also has a dedicated fitness instructor who offers complimentary exercise classes, as well as wellness guidance to residents at the senior living community. For a nominal fee, residents can opt-in to an advanced wellness plan that includes individualized training with the fitness instructor two times a week and access to AlterG®, an anti-gravity treadmill. This unique piece of equipment allows seniors to move, walk, run, build strength, and improve cardio conditioning, without the risk of falling by using air pressure to gently decrease 100 percent body weight to as low as 20 percent. Barbara Lewandowski, resident life director at Arbour Square, creates a monthly schedule filled with various recreational and fitness activities instructed by employees and individuals from the local area. Activities are provided at no extra charge with some events being open to the public. “I came from a family that fishes and hunts, shoots archery and shotgun competitively. 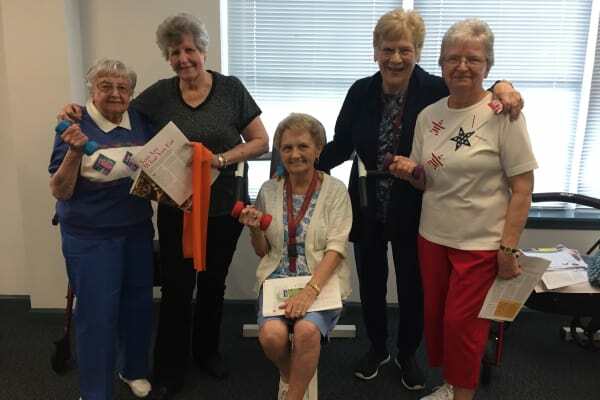 I realized early on how important it is to follow your passion no matter your age or limitations,” said Lewandowski, which is also why she considers residents’ opinions when scheduling activities, such as fishing and golfing. “Now that I’m in my 80s, it’s nice to be able to still do some of the things I loved when I was younger. I fished since I was a boy, and I love that I have the opportunity to fish again,” said Austin Hayes, a resident at Arbour Square. Senior exercise classes are also scheduled with adaptability in mind so residents with limitations can still experience the benefits from physical activity. Stretchersize is an exercise program that can be modified to a person’s ability. Regardless of the change, the program still improves general fitness, flexibility, mobility, balance and muscle tone through purposeful movement. Additional classes include Roll and Stroll, a supervised aerobics-based program of walking with others, both indoors and outdoors, for fitness and enjoyment; circuit training, an all-levels, fun, fast-paced exercise class set to music; and tai chi, a class focused on graceful movements and designed as a gentle way to fight stress and anxiety, while increasing flexibility and balance. "Circuit Training and Flexercise classes are the best,” said Phil K., a resident at Arbour Square. “Not only do the classes get me in shape, but the instructor also makes it really fun to do!" In addition to the enhancements to fitness programs, residents can expect to taste changes in the menu. Award-winning chef David Lademann is looking to revamp recipes using fresh fruits and vegetables from the seniors’ community garden. “We are trying to incorporate a more farm-to-table type of dining,” said Kehan. But, what can residents and incoming seniors expect in the near future? How about a boxing class, more Couples Night-In events with live music for dancing, and additional destination outings? Find out first-hand why seniors are loving life here. Call 267-677-1200 to schedule a non-obligatory tour. Arbour Square recently joined in local efforts to donate recycled eyeglasses to the Lions Club International Recycle for Sight program. Since June, Arbour Square residents have been donating their used glasses in donation boxes across their senior living community. This is Arbour Square’s first time participating in the year-round Recycle for Sight program, which collects about 30 million pairs of glasses annually. The Lions Club International Recycle for Sight program takes glasses that are no longer in use and sends them to a special recycling facility in New Jersey. At this facility, the glasses are sorted, cleaned, and evaluated to determine their prescription. Following this sorting, they are distributed to people in need all over the world. Arbour Square joins a number of other local organizations that dedicate their time and resources to providing glasses to those in need. “We also get help from the local Leo Club,” said Harubin. He is also the advisor of Souderton Area School District’s Leo Club. In October, the Lions Club will hold a White Cane Day to raise additional funds for the visually impaired. Community members can make monetary donations by visiting local supermarkets; all proceeds will be donated to programs for those in need. Whiteman has been a Lions Club member for over 30 years and is responsible for cooking during the annual Chicken BBQ in Franconia. Harubin admits his claim to fame is running the funnel cake stand during Harleysville’s Jaycees County Day Fair. Arbour Square of Harleysville is an all-inclusive, independent living community that promotes a vibrant retirement lifestyle. Services include delicious home cooked meals served in our beautiful dining room, activities and social events, exercise and wellness programs, trips and transportation, housekeeping services and much more. Arbour Square offers residents a month-to-month lease with no long-term contracts or entrance fees. For more information, please call Julie Kline, director of marketing, at 267-677-1204, or visit www.arboursquare.com. The Michael J. Fox Foundation received $3,000 in charitable donations on Wednesday, February 3 after a presentation at Arbour Square of Harleysville’s monthly Parkinson’s support group meeting. Deal visited Arbour Square as a presenter for the monthly Parkinson’s support group meeting, which is held the fourth Wednesday of every month. “We discussed how the Michael J. Fox foundation started, as well as some of the current research that is going on,” said Deal. At the conclusion of Deal’s presentation, the Arbour Square Resident’s Association made a donation of $1,000. This donation was matched by Arbour Square resident and Dean Mininger, as well as another couple in attendance, for a total donation of $3,000. The Selection Committee has only bestowed this honor to four recipients of the 9th District Pennsylvania American Legion. Weaver, 89, a 50 year member of the American Legion, was presented with the award by 9th District Commander, John Pashley; Deputy District Commander, William Douglass; and Past Department Commander of Pennsylvania, Joseph V. Glazier. She was bestowed the award in honor of her longevity of service to the Pennsylvania American Legion. The American Legion is the nation’s largest wartime Veterans service organization aimed at advocating patriotism across the United States through diverse programs and member benefits. There are more than 800 American Legion Posts across the state of Pennsylvania; the 9th District encompasses Bucks and Montgomery Counties. Her commitment to serving others began early in her life. While a nurse at Camp Indian Run, Weaver, then 22, heard a radio announcement referencing the turmoil in Korea. “I decided to put my money where my mouth was and joined the Air Force,” said Weaver. She reported for duty on Dec. 4, 1950. She did not receive basic training because while in high school she was in the Civil Air Patrol, which taught her military courtesy and discipline. Instead, on her second day she was placed in a psychiatry ward, and was trained in neuropsychology. After her service during the Korean War, she married and spent the next ten years in the Active Reserves. Weaver then went on to employment as a Suicide and Crisis Intervention Counselor for the City of Philadelphia, retiring in 1986. She also served as the American Legion’s chairperson of the Children and Youth Committee for Pennsylvania. “I’ve had a very full life. It’s a great honor to be recognized and receive this award from the Legion,” said Weaver, smiling. As part of the award, she was presented with a legion cap that is worn at all legion meetings, special appearances, and other ceremonies. Weaver cherishes her cap and is proud of her dedication to serving others has culminated to this honorary award. Arbour Square of Harleysville is an all-inclusive, independent living community that promotes a vibrant retirement lifestyle. Services include delicious home cooked meals served in our beautiful dining room, activities and social events, exercise and wellness programs, trips and transportation, housekeeping services and much more. Arbour Square offers residents a month-to-month lease with no long-term contracts or entrance fees. For more information, please call Julie Kline, director of marketing, at 267-677-1200. HARLEYSVILLE, Pa., Nov. 20, 2017 – Step inside Arbour Square of Harleysville and stroll down the brick walkway coined “Main Street,” pass by the 50s Café, bank, and salon, where you’ll find a quaint, tucked away gem– the Nifty Thrifty Shoppe. The Arbour Square Residents Association invites local community members to this unique thrift store formerly only open to residents and their guests. 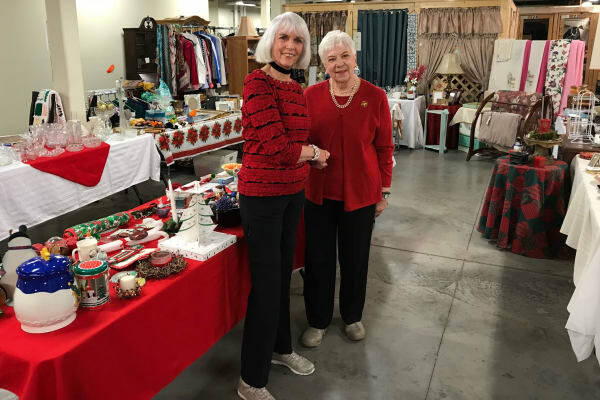 The Nifty Thrifty Shoppe began Fourth of July weekend in 2014, while residents were collecting donations to sell at the annual Holiday Bazaar held in November. Some residents started asking if they could purchase items, and it sparked an idea. Arbour Square resident and thrift shop originator Dot Hendershot, 83, took the idea to Executive Director Mimi Kehan and the concept of the Nifty Thrifty Shoppe was born. Since then, the thrift shop has grown in popularity as a hot spot for purchasing gently used clothing, household items and furniture. “Our residents are really unique. Many have a fantastic entrepreneurial spirit, and when they came to us with this idea, we couldn’t say no. The store is completely run and managed by residents, who take enormous pride in it,” says Kehan. Hendershot and fellow resident, Lyn Serianni, 82, oversee the operations of the Nifty Thrifty Shoppe in collaboration with The Arbour Square Resident Association. When residents aren’t stopping by to browse or purchase various goods, many frequently volunteer their time to help sort, price and tend to the shop. “We have little knick-knacks, kitchenware items, furniture pieces, clothes, and personal care items,” said Hendershot. Both women agree that the hottest item for donation and purchase is furniture. To uphold Hendershot’s and Serianni’s strict standards, only items donated by Arbour Square residents are accepted because each item goes through an inspection and approval process before being sold. All of the donation proceeds benefit local charitable organizations. Funds are regularly donated to the local EMS, police and fire departments, as well as other community-based charitable organizations. In the past, donations were made to Keystone Opportunity Center in Souderton and Manna on Main Street in Lansdale. Local community members are invited to stop by the Nifty Thrifty Shoppe at Arbour Square and take a look at all the fantastic items for sale. “We offer everything, other than food items at affordable prices,” said Serianni. The Nifty Thrifty Shoppe is open to residents and the public Monday through Saturday from 10 a.m. to 11:30 a.m. and 1 p.m. to 3 p.m.
Arbour Square of Harleysville is an all-inclusive, independent living community that promotes a vibrant retirement lifestyle. Services include delicious home cooked meals served in our beautiful dining room, activities and social events, exercise and wellness programs, trips and transportation, housekeeping services and much more. Arbour Square offers residents a month-to-month lease with no long-term contracts or entrance fees. For more information, please call Julie Kline, director of marketing, at 267-677-1204. HARLEYSVILLE, Pa., Oct. 31, 2017 – When Diane Rathschmidt stepped up to the easel for the first-time during a watercolor class held at Arbour Square, she didn’t realize she would discover a talent and passion for the Arts. Wismer is a well-known Bucks County artist and art teacher. She teaches all media and enjoys seeing students explore and experiment with color and different mediums to discover their hidden talents. Wismer teaches Watercolor 101 at Arbour Square twice a month. Rathschmidt finds the watercolor class easy to follow and continues her newfound hobby outside the classroom. She set-up her own painting area in her spacious apartment to accommodate her passion, and is now able to produce artworks whenever a creative mood strikes her. 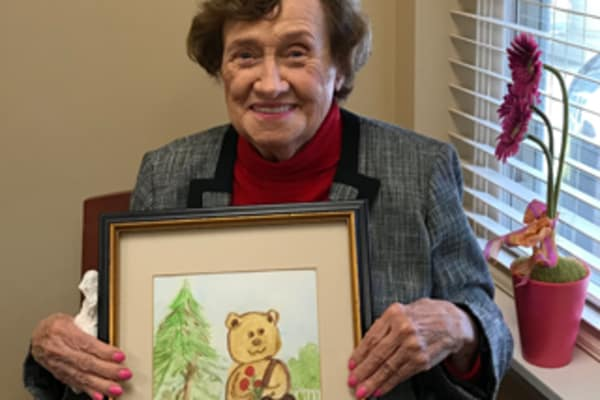 Recently, Rathschmidt entered her painting into Arbour Square’s annual Artisan Exhibit, where residents and staff members showcased their collection of artworks. In addition, family members and local community members came out to show support for the artistic abilities of the residents. If you are interested in joining the watercolor class or learning more about the activities offered at Arbour Square, please call Julie Kline, director of marketing, at 267-677-1204. HARLEYSVILLE, Pa., April 13, 2017 – David Lademann, Director of Culinary Services at Arbour Square, was awarded the Presidential Award from the American Culinary Federation (ACF) on Sunday, April 9. The Presidential Award is chosen by the President of the ACF Philadelphia Chapter and is given to a member of the chapter who has gone out of their way to support the chapter in any way that they can. 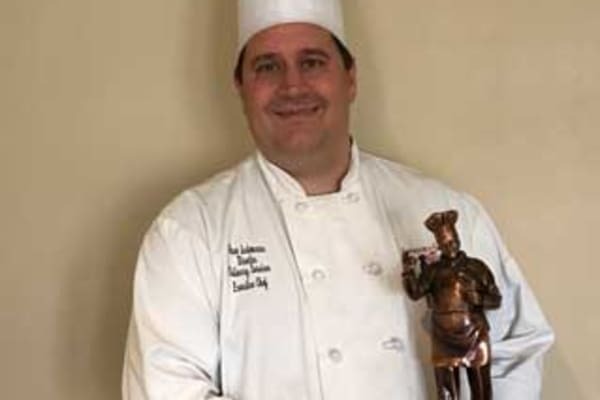 As the Director of Culinary Services at Arbour Square, Lademann is responsible for all kitchen operations and maintaining a healthy menu for the residents. Prior to working at Arbour Square, Lademann worked at The Blair Mill Inn for 15 years as the executive chef. He and his wife currently live in Jenkintown with their three daughters. Dave and his family dedicate a lot of their free time to help the ACF with its events. Part of the reason McCombe chose Lademann for the award is due to his willingness to volunteer for just about everything. 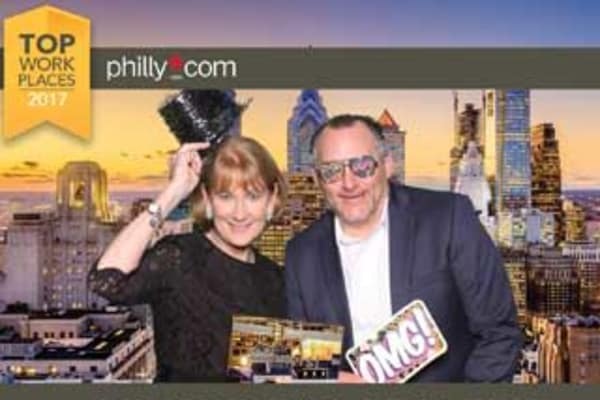 “Last year we put a Phillies game tailgate party together and Dave organized everything. He got all the food and got items donated and then he and his family came and cooked at the event. When they were done, they took the excess food to be donated to a shelter,” McCombe said. 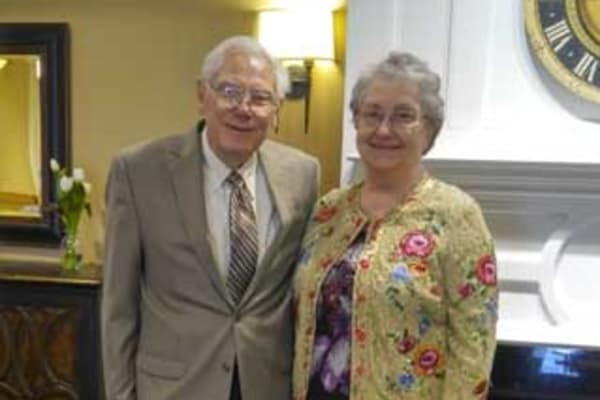 He continued to praise Lademann and his family for their consistent contributions to the ACF. For more information about Dave and how he provides healthy dining options for residents at Arbour Square, or to speak with someone about how your loved one can live life to the fullest at Arbour Square, please call 267-677-1200. Harleysville, Pa., June 20, 2017 – Arbour Square of Harleysville had the honor of presenting Jerry Zheng, a student of Souderton Area High School and North Montco Technical Career Center, with the 2017 Keith Howe Memorial Scholarship. Zheng recently graduated from Souderton Area High School, and was ranked in the top five percentile of his graduating class. “Jerry is among the most extraordinary and unique students I have known,” said Souderton Area High School’s Principal, Sam Varano. 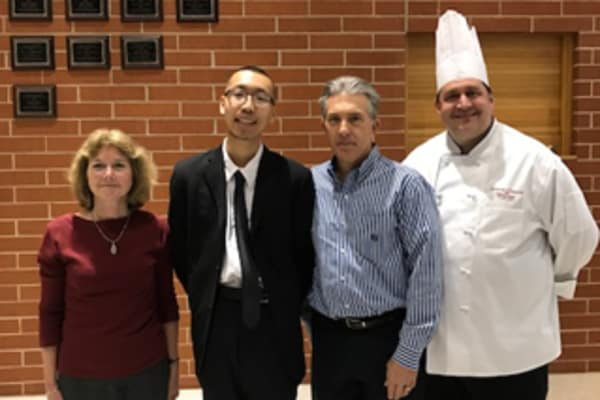 “His potential to contribute to our local, regional, and world communities is limitless.” Zheng currently works as a buffet server at Henning’s Supermarket in Harleysville, as well as Country Garden Chinese Restaurant, which happens to be owned by his family. Zheng’s desire to pursue a career in the culinary arts was sparked by his time spent at his family’s restaurant. “Even though my family owns a house, we practically live in the restaurant,” said Zheng. At his middle school, Zheng took an aptitude test which revealed a high desire to serve others through hands-on work. “I always loved hands-on work. I enjoy carpentry, using electrical tools, and menial labor chores,” said Zheng. The Keith Michael Howe Memorial Scholarship is named after a graduate of Souderton Area High School who passed away due to injuries sustained in a car accident in late 2012. This scholarship, in his memory, is awarded to a student who has demonstrated a gift in a vocational field, a passion for working closely and professionally with individuals of all ages and has a team-player personality. Howe was a role model to all who worked with him in the Arbour Square Community. He touched the hearts of all the senior and staff members. HARLEYSVILLE, Pa., April 13, 2017 – Residents of Arbour Square of Harleysville attended the annual Seniors’ Prom on Saturday, April 8, hosted by the Souderton Area High School Leo Club. Residents visited the high school for a Candy Land themed night full of dancing, music, and food. The Seniors’ Prom is open to any seniors who live in the Souderton area and residents of Arbour Square were all given an invitation by the Resident Life Department. Arbour Square resident, Lois Diephaus, was there to experience the evening. “It was a lot more than I ever expected it to be,” she said. As the guests arrived in their prom attire, they were greeted at the entrance and escorted via golf cart to the reception area. Although Diephaus was set up with her date, she insists it’s not just a couples’ event. There were a number of people dancing with friends and there was no couples stigma. “I was amazed at how many of these people were out there dancing, and I mean, they could have been professional dancers,” she said. “The music was fabulous. It was 50s, some 60s and even some 40s, going back to Glen Miller’s music and that type of thing,” said Diephaus. “They had some faster music like jitterbugging and at one point they were even teaching different kinds of line dancing.” She and her date danced a lot, about 80 percent of time they were there, and the results were very sore knees and a very sore back. Despite the soreness, Diephaus could not have been happier with the night. “I sure would go again next year; I would highly promote it,” she said. “The DJ was fantastic; he knew the type of music to play for the group that was there.” She offered nothing but praises about their “limousine” as well, “Funny thing about it is we were riding over in the van in all of our formal dresses. I’ve been in limos many, many times but this is the first time I’ve been to a dance on a bus!” Residents were escorted by Resident Life Assistant, Pat Malvoso, who not only helped transport everyone, but also attended the dance himself. “Pat did a fabulous job of getting everyone on the buses and over there. Needless to say, I just love this place so much,” said Diephaus. HARLEYSVILLE, Pa., Feb. 9, 2017 – The Residents’ Association at Arbour Square of Harleysville donated a $1,000 check to Manna on Main Street during the holiday season to help end hunger in the North Penn region. 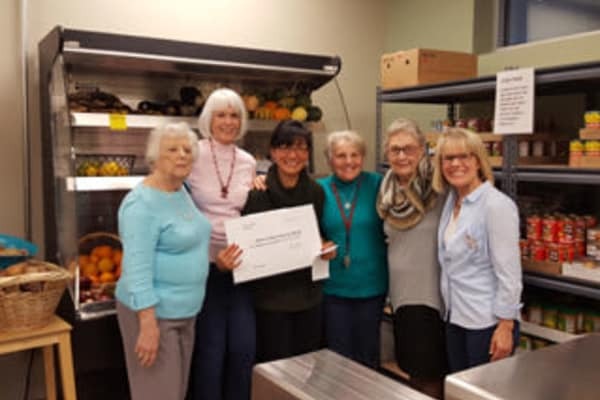 Every year during the holiday season, the Residents’ Association at Arbour Square chooses to donate to a food pantry or other charitable foundation. This was the first time the Residents’ Association donated to Manna on Main Street. “We wanted to broaden our horizons into the community,” said Residents’ Association President Patricia Frey. 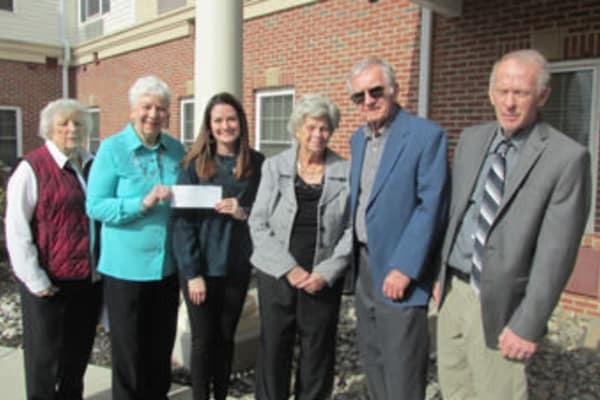 “We were very thankful when we were told that the Residents’ Association at Arbour Square would be coming to donate the $1,000 check; it was a wonderful visit,” said Manna on Main Street Development Officer Paige Harker. Manna on Main Street is a 501(c)(3) nonprofit corporation that provides emergency food services for people who are “food insecure” in Montgomery County. There are 3,500 people, or 11% of people in the North Penn region who fit into this category. Manna provides a variety of services to help these people meet their food needs. In the 2016 fiscal year, Manna on Main Street raised $116,000 in financial aid (www.mannaonmain.org). For more information about charitable opportunities, or to speak with someone about how your loved one can live life to the fullest at Arbour Square, please call 215-677-1204.